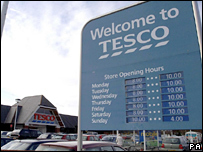 Students will be able to pay towards their university fees using points on Tesco Clubcards. The Open University has teamed up with the supermarket giant to offer money off its undergraduate tuition fees in exchange for loyalty card vouchers. For every £10 worth of Clubcard vouchers, students will receive £40 towards the cost of their course. To receive this £40 fees discount, students would need to have spent £1,000 in the store. The Open University's vice-chancellor Professor Brenda Gourley said the partnership was true to its principles of open access. "The partnership allows the university to extend our reach to new students... we aim to make access to the university's programmes as flexible as possible. "This extends to giving our students a number of options to meet course fees - and this new deal is now one of those options," said Professor Gourley. A spokesman for the university rejected suggestions that paying for academic courses in this way led to them being undervalued. She added: "A lot of students are concerned about incurring debts - it is a way of studying without incurring higher debts. "Tesco is the biggest supermarket and if students are already spending their money in Tesco then it is a good way to help pay for courses." Head of partnerships at Tesco Freetime said: "We're delighted to be working with the Open University to offer customers the opportunity to put Tesco vouchers towards higher education. "The programme provides a great opening for customers to achieve some valuable qualifications by studying at home at their own pace without having to give up the day job." The Open University is the UK's largest university and teaches 35% of all part-time undergraduate students each year. There are no qualification requirements to study at the OU, and 33% of undergraduates begin courses with fewer than two A-levels. The National Union of Students said the move was well-intentioned, but warned of a growing consumerism in the higher education market. NUS President Gemma Tumelty said: "This move shows the worrying extent to which consumerism is becoming integral to the student experience. "People should be choosing where to go based on their educational needs and not costs. "The savings on offer may not be substantial, but with debt levels as they are it is not surprising that money saving deals are being targeted at potential students- and crude as it may seem this deal is clearly well-intentioned."